Xander and I had the great pleasure of visiting Berlin for the 2nd time over the past 5 days. I’ll first say simply that it’s stolen my heart for the second time and I believe I think of it as Hemingway thought of Paris. But it's a city that can haunt you constantly, if you're looking even a bit close. Those scars have a lot to teach us and remind us. There are bullet holes across many buildings in the center, near the old and new places of government (near the Reichstag, and the former SS office). Unfortunately many of these are museums, churches, or other old and beautiful pieces of architecture. 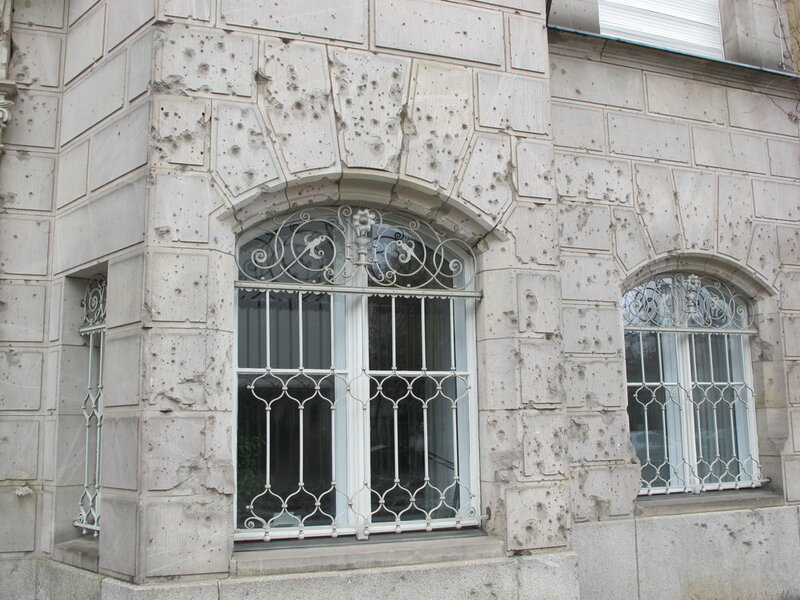 Such bullet-holes come, of course, from the Soviet conquest of Berlin at the end of the 2nd World War. Many buildings have their bullet holes covered with cement, but the patchwork of shades tells the tale just as clearly as if the holes themselves were there. It's a reminder that Berlin still hasn't completely healed from its devastation at the end of the war. All of this brought on by Germany's experiment with Fascism--a desperate attempt by a frustrated, frightened plurality (43% of voters) to renew German strength, security, and dignity. I can only imagine what the average German citizen felt 12 years later, when the war finally ended, Germany was cut in two, and Berlin was split into 3 Allied sectors (the West) and one Communist sector (East). The citizens of Berlin spent years in shock at what they'd done, literally picking up pieces of rubble of their shattered city, now occupied by 4 foreign powers. Even more visible in Berlin today are the scars from the Berlin Wall. What's so interesting and harrowing about this is that you can almost always see where the Wall used to be. Sometimes it is so obvious that it is literally a monument. Other times, a vast no-man's land remains, having been haphazardly turned into a park, or an S-Bahn railway. Yet other times, new buildings sit amongst old ones--the old ones still have their sides bricked up, without windows. When you look and see a lot of buildings with blank sides, you know the wall used to run by. The physical, human, and even moral destruction of the East German regime can't compete with the Nazi regime. But the rapid reversal from ultra-right to ultra-left meant the Fascist SS was simply replaced by the Communist Stazi. Where previously the Germans built walls around Jewish quarters, they now built around West Berlin. Families were cut off. People disappeared at night, and were taken to interrogation prisons where they were tortured, deprived of sleep and hunger, and forced to write false confessions before being released to less-terrible prisons (I recommend the Stasi Museum tour as a way to actually understand it). East Berlin was so terrible that many tried to escape, and the regime had to murder them to prevent it. Just think about that. You can talk about and look at photos of Berlin's terrible history--understanding both what it suffered and what it did to others--but seeing it brings it home in a way that I can't relate. I'm sure you've seen video of the moon landing--but how different would it be to stand on the moon, staring at the Lunar Module? This was all a terrible reminder of where democracy can go, where countries can go when they are afraid and angry, when they want a revolution, when they have someone to blame for their problems. As Germany ran right or left, it tore itself and others apart. It is impossible to make a truly general statement about a city, no matter how long a visit--much less after 5 days. But what did I see in that 5 days, that I might not expect? I had expected the Germans to be fairly serene and moderate, and for extremism to be suppressed socially--"we've been through that, no thanks." Note the guy throwing a bike. The Antifaschiste Aktion group is a bit of a vigilante group that takes it on itself to oppose fascists, nationalists, and cops. I saw similar Antifasciste Aktion stickers/posters, as well as anti-cop slogans, in two pretty intense left-wing bars in the city (no photos were allowed). I didn't know what it was at first, but I later learned--by stumbling across it--that Koepi is an anarchist/communist compound in Kreuzberg. It's an old abandoned building that was taken over by this group, and is now pretty heavily fortified. It declares itself a "no cops" zone, and after some research I found that they generally reject the laws of the state and city, don't pay taxes, and the like. Not violent, but operating outside of the law, and proudly. So "Koepi Bleibt" means "Koepi Stands" or "Koepi Remains." It turns out that the city has tried to end the anarchist/communist communes/compounds (there's more than one; I'm not sure how many), and that Koepi has resisted being dismantled. It is a highly politicized symbolic fight against the government, and it seems to have the support of enough folks that I kept mistakenly bumping into them. What's it all mean? Possibly not much. It may well be the case that Berlin has had such right-wing, left-wing, and anarchist groups--who seem more vocal than I'm accustomed to in a big US city--since the wall fell. EDIT: If you look at the first comment below, you'll get a wonderful history on the left wing in Berlin. It's been around since the 1960s and is nothing new. But it does seem suspiciously like a larger trend of the right and left getting right-er and left-er in the US and Europe. From the UK to the US to France to Hungary, the farther right seems more dominant. In places like Spain, it's the left. In Greece, it's both. Anti-establishment parties like UKIP, Trump, and the Pirate Party are gaining ground--including in Germany. People are frustrated and so tired of the status quo that they're starting to consider some radically different approaches that we've been used to since the end of the Cold War. This is possibly true even in Germany, where the scars of Fascism and Communism are still very raw. We have stronger institutions than the democracies of the early 1900s; some lessons were learned and cooked into place. But the centrist, status-quo should be asking itself: what will it take to make the trend towards extremism a flirtation rather than a new normal?